When we were newlyweds, I planned a romantic night at home which has become a tradition for my husband and I. Since my name is Cher (a very French name), I created the “La Cher Bed & Breakfast”. 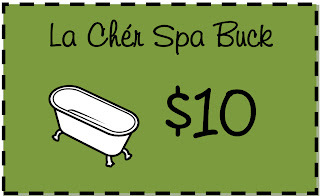 After we had been guests in just about every room of that bed and breakfast, I decided to scale it up to the “La Cher Spa”. You can download this entire document by clicking here. 1. When he first arrived at the spa, he was shown to the 2nd bathroom (not the one set up as a spa) where he could shave his face and get into his white robe. (If you want to get really fancy, put a little tag on the robe with your spa’s name/logo on it). 2. When he was ready, he came upstairs to enjoy “Dinner in the Oasis” – you can serve whatever you want. 3. I let him relax and digest his meal in a little “waiting area” that I made in our living room with a chair, a fake tree, some magazines, and some dove chocolates in a bowl. While he waited, I went to the bathroom to make sure all was ready (I had set up everything earlier). I ran a hot bubble bath, lit the candles, set up the spa sounds (see below) etc. 5. While he was in the tub, I put his robe and a white towel in the dryer so they’d be toasty warm when he got out---that’s always luxurious! *Spa Music: I set up my laptop in the bathroom. http://www.spasounds.com.au/ - has an awesome playlist on the website which will play 4 different spa songs for free! 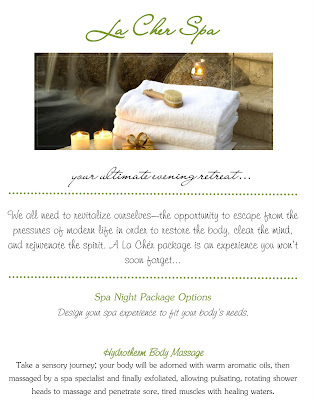 And there you have it...a wonderfully romantic evening that is sure to be even better than the real spa itself! You're amazing!!! My husband's been a little stressed out lately. I'm going to try this one out! Thank you so much for the great date night! 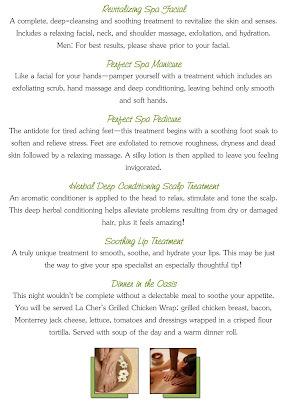 I did the spa night for my husband this past weekend and it was a HUGE hit. He absolutely LOVED it. I started giving out the spa bucks on Sunday night. He soon figured out that the more he did around the house, the more he got and before I knew it he was wanting to clean up everything for more "spa bucks". It was so fun to see his excitement and not knowing what was going on or when it was going to happen. It was so much fun. Thank you so much for the wonderful date night. I read your blog daily!